Assume he didn't collude with Russia. Vladimir Putin doesn't have any dirt on him. He isn't gullible enough to believe Mr Putin's lies, or morally deficient enough to excuse them. He isn't too stupid to know what he's talking about or too lazy to do his job properly. Accept all those things. 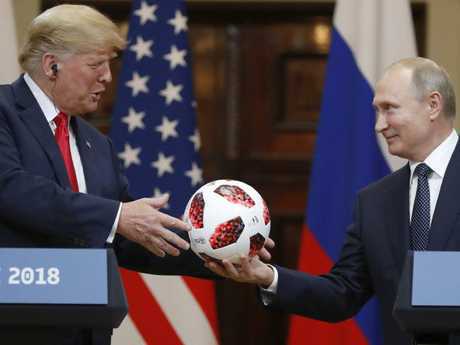 Grant Mr Trump every charity, rig each assumption in his favour, and the best possible interpretation of his subservient, bootlicking performance at last night's summit with Mr Putin is that he's a coward. He is - supposedly - a tough guy. A ruthless businessman, straight talker and street fighter with the guts to insult anyone, no matter how rich or powerful they are. It was a moment that called for resolve from America's president. Russia's invasion of Crimea, support for murderous Syrian dictator Bashar al-Assad, meddling in multiple foreign elections and bleak human rights record demanded a display of moral clarity. Instead, Mr Trump surrendered. He answered Mr Putin's smug strongman act with deference. Submissiveness. Weakness. Mr Putin was "strong and powerful in his denials" of election meddling, Mr Trump said, as though that settled the matter. "My people come to me. Dan Coats (Mr Trump's director of national intelligence) came to me, some others, they said they think it's Russia. I have President Putin, he just said to me it's not Russia. I will say this, I don't see any reason why it would be," Mr Trump said. "All I can do is ask the question." A foreign power targeted the United States in a massive cyber attack, and apparently all the American president - supposedly the most powerful man on the planet - can do about it is ask a question. Mr Trump doesn't want to believe Russia helped him. That would be a blow to his ego, even if it had no impact on the result, so he is desperate to latch on to any alternative explanation. This would be pathetic, yes, but at least understandable, if Mr Trump's weird obsequiousness were limited to the question of election meddling. But the whole press conference was the same. 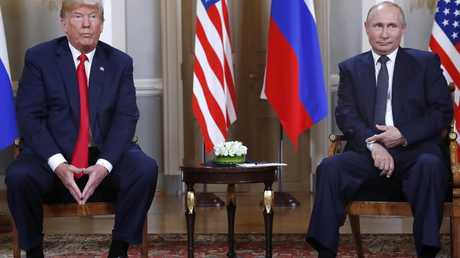 Mr Trump had nothing substantive to say about Russia's conduct, instead blaming the sour relations between the two nations on America. Mr Putin may as well have spoken on his behalf. Mr Trump is, in fact, a classic bully. He is full of bluster when talking behind someone's back, but doesn't have the spine to confront them in person. Take Mr Trump's extraordinary broadside against British prime minister Theresa May last week, when he badmouthed her Brexit plans and heaped praise on her political nemesis, Boris Johnson, during an interview with The Sun. Being the living embodiment of a bull in a china shop, Mr Trump presumably didn't realise he was committing a monumental diplomatic screw-up. Still, it was so bad that some pundits speculated he was trying to destabilise the British Government. Mr Trump frequently does this. He insults someone in private, and when his comments inevitably leak - or just get reported, because sometimes they're on the record - he calls them "fake news". It's blatant cowardice. It accomplished nothing. Mr Trump had a lovely chat with one of the world's most inescapably evil dictators, showered him with praise, and then they both signed a piece of paper packed with promises so vague they were practically meaningless - promises Kim is reportedly already breaking. But that would have required a tough conversation, with Mr Trump calling Kim out on his crap. 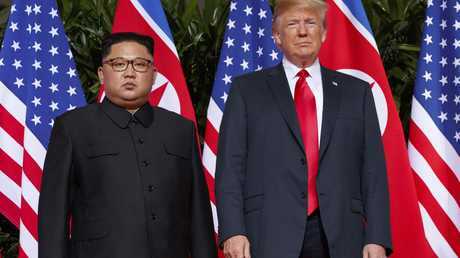 "Little Rocket Man", as Mr Trump once called Kim from the safety of his Twitter handle, might have stormed out of the summit, leaving everyone looking like fools. It takes no bravery at all for Mr Trump to sit in the White House residence every morning tweeting mean things about Canada, Mexico or the European Union. They are easy targets, because they can't afford to alienate the US. It's the diplomatic equivalent of a school bully taunting the weakest kid in class. The moment he faces anyone who could be a threat in person, his bravado evaporates. The result is a bizarre policy of pointless hostility towards America's allies and deference for its foes. Stop mistaking Mr Trump's petty, spiteful aggression for strength. When it actually matters, his spine always goes missing.